In Puente Antiguo, New Mexico astrophyisist Jane Foster and her team Dr. Erik Selvig and Darcy Lewis are studying the night sky on their monitors in a converted motor home in the middle of the desert. The sky illuminated in a strange configuration and a tornado shaped cloud hurtles to the earth. As they race to through the clouds of dust their vehicle strikes a human figure. They rush out to check on him Jane hopes that he's not dead before wondering how he came to be there. Anthony Hopkins narrates the story of how in Tonesberg, Norway 965 AD mankind understood simple truths that they were not alone in the universe. The frost giants came and threatened the mortal world with a new ice age. Humanity was saved by Odin and the warriors of the realm of Asgard. The source of the frost giant power was taken from them. After the war Asgard withdrew from the other worlds/realms and brought peace to the universe. Hopkins as Odin is teaching this history to his children Thor and Loki who both could someday be kings. Thor (Chris Hemsworth) now older, stronger and handsome is ready to become king. Thor is the holder of the hammer Mjöllnir forged in the heart of a dying star. The weapon has no equal, it is a weapon to destroy or a tool to build. On the day of his coronation Asgard is attacked frost giants who have come to take the casket of power guarded by a big metal figure called the Destroyer. Hot headed Thor seeks to avenge the breach of the truce by going to the frost giant planet with the Warriors 3: Volstagg (Ray Stevenson), Fandral (Josh Dallas), Hogun (Tadanobu Asano) and Lady Sif (Jaimie Alexander). Despite entreaties by his brother Loki (Tom Hiddleston) not to go. It starts a war that causes his father Odin to declare that Thor is vain, arrogant and is stripped of his power. Thor expelled from Asgard and banished to earth through the wormhole. He also sends the hammer that can only be freed when Thor is deemed worthy. The second part of the movie picks up from the introduction when Jane (Natalie Portman) runs into a disoriented Thor. They take him to the hospital and everyone thinks he's a head case because he is ranting about being the son of Odin. Meanwhile the landing of the hammer has created a crater in the desert. Like King Arthur's Excalibur sword in the stone, the residents of the area all come to try their hand in extracting the hammer from the rock. That is until S.H.I.E.L.D agents come to cordon off the area. Jane, Erik Selvig ( Stellan Skarsgård) and Darcy (Kat Dennings) soon find their lab and all their research is also confiscated. 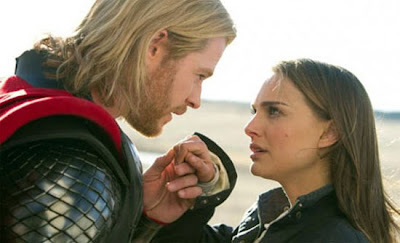 The only way she can get some answers about the weird incidences in the sky is to help Thor. He promises to give her answers if she can drive him to the hammer. Agent Coulson (Clark Gregg) is very interested on how Thor was able to get past his well trained guards. Kenneth Branagh is better known for directing Shakespeare brings that same larger than life dramatic poetry to themes of love and treachery among the Asgards. At the same time he balances the ensemble cast on earth with great timing and focus. The soundtrack has just enough emphasis on the action without giving away the result. Portman does quiet well as the awkward and dedicated scientist. Skarsgård as her doubting associate and Dennings as the goofy sidekick add a bit of comic relief without being annoying. It would have been nice to have more action from the Warriors 3, but they still have plenty of great stunts to do. Helmsworth proved he was someone to watch in Star Trek delivers as Thor and is impressive without his shirt. The most memorable character is Heimdall the Gatekeeper (Idris Elba). There were 6 writers on the script which normally would have meant disaster. In this case, it actually works as the most satisfying comic book adaptation to date.